I love beginning a room with an Oriental rug as the foundation. There is no better rug in the world for durability and stain resistance, let alone beauty and craftsmanship. Furthermore, with so many Baby Boomers downsizing (many of whom bought some really nice heirloom pieces) the availability of quality Oriental rugs at auction and on sites like Craigslist, eBay, Etsy, and EBTH at Big Box store prices makes using them a no-brainer. I’m working with a client now who just inherited two stunning and huge Oriental rugs from her mother. The one on the left will go in the living room and the one on right will go in the dining room. I love the teal!!! Some may find creating a scheme by beginning with an Oriental as a foundation to be limiting. I understand. 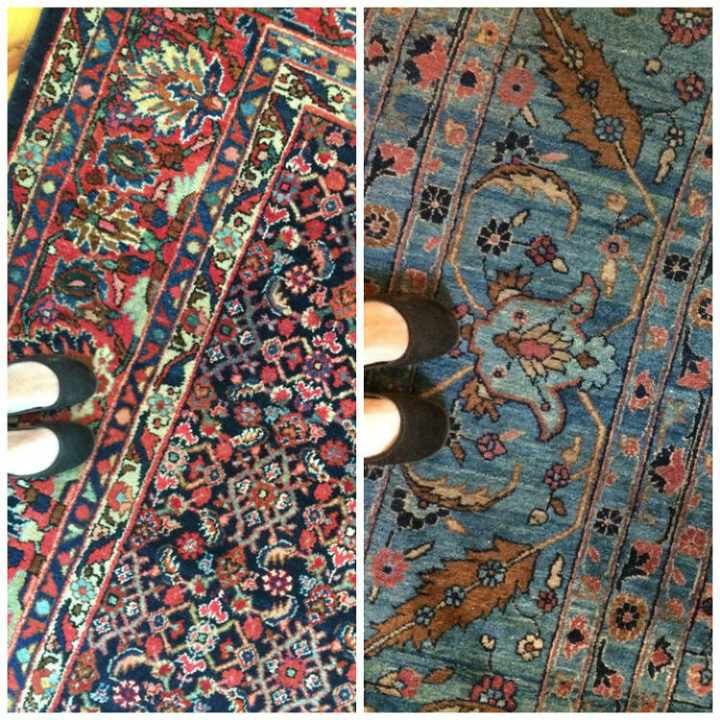 Orientals are most often found in reds and blues and blacks, like the left rug — not the most popular color combination these days. And whatever colors you use in one room, affects the next room, and the next, and so forth. However, the payoffs can be big, too. You add immediate patina and soul in a room, they have inherent value, and an Oriental can be dressed up or dressed down depending on the rest of your scheme. We already talked about durability. You can go overkill on the Orientals, though. As great as they are, unless you want to live in a museum, you don’t want them in every room. The problem is that there are so many gorgeous Orientals out there, how do you know when it’s time to stop? How do you create a flow from room to room that doesn’t feel stodgy? We’ve mixed up those more ornate rugs with simpler tonal and geometric floor coverings in between. When the floor in a room has a prominent pattern, the furnishings tend toward solid, tonal, or small scale pattern. When the floor pattern is quieter, the pattern on the furnishings go bigger. We have a loose color scheme that keeps a thread going from room to room. First let’s take a rug tour of a house with a number of gorgeous Orientals, and then we’ll do a little how-to exercise. I love Kelly Rogers’ neo-traditional aesthetic, unique color sensibility, and family-friendly design, all of which she deftly employs in her own home, in addition to her very lucky clients’. When I did my design internship with her firm, I became well acquainted with a few of her projects, including her Wonderful Waban home. While I could use pics of my own home to illustrate our Oriental rug map exercise, you’ve seen enough of them already! Kelly’s also serves as a perfect best-practice scenario for our Oriental Rug Map. Let’s begin. Kelly and her family live in a late 19th c. colonial revival house. Photos are by Eric Roth. Awesome woodwork. 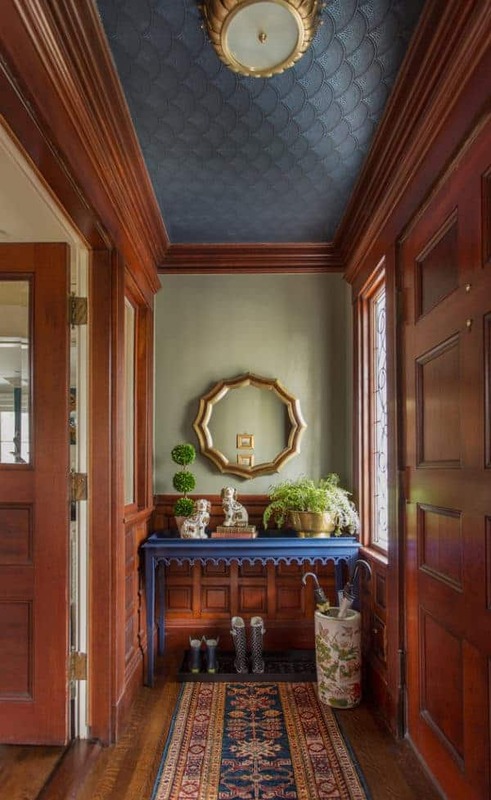 The small entrance pairs an Oriental in blues, reds, and golds, with a stained woodwork and a yellowy sage green wall color. Genius, as is the ceiling wallpaper. 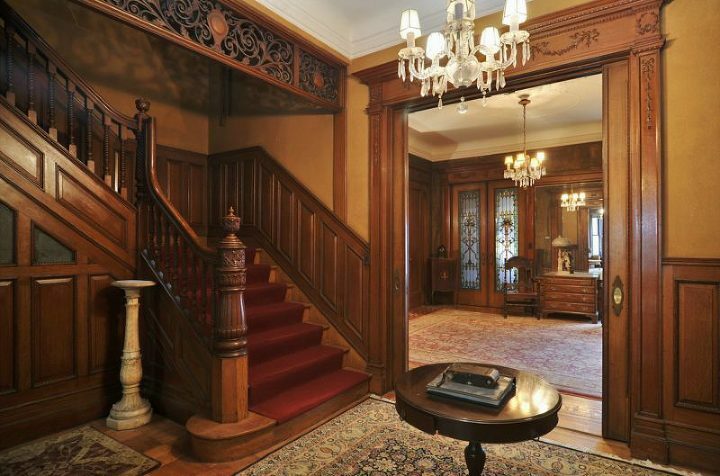 To the right of the entrance is the living room. Kelly uses a small Oriental layered over a modern tonal rug in a larger modern geometric pattern in gold and apricot. There’s a tension between the two rugs that is perfect because they aren’t matchy-matchy but make sense in the larger color/pattern scheme . Solid colors on the upholstery and walls, highlighted by a little red trim let that tension shine. Across the foyer is Kelly’s “manbrary,” her husband’s sanctuary. The rug is a solid bound carpet from Radici here, connected to the previous rooms by the room’s blue and khaki colors. The pattern is mainly in the hide rug overlay, chairs, and plaid Roman shades. The dining room has a showpiece Oriental from Landry and Arcari in reds, blues, and greens. Golds in the chairs hark back to the entry gold and the khaki in the manbrary. Green and gold wallpaper. The adjoining family room (Now in progress again. See Kelly’s blog Interiors for Families for the latest on her house’s renovation, which includes a new family room. I’m so excited to see what she does!) has a solid neutral rug, sagey greens in the upholstery, and creams on the walls. There’s no fixed rule, though. You can certainly use Orientals in adjacent rooms as long as the color and pattern scale are mixed. Let’s take some examples from this coming Monday’s AMAZING rug auction that I talked about in last week’s post. These rugs are all still up for grabs. Click on the link to get to the post with the individual rug links, along with some awesome Moroccans and kilims for auction, too. Today I’ll just work with my favorite traditional rugs. So many of these coordinate, but I’ll just choose one combination for now, mixing my scale, pattern, and color. I’m head-over-heels for these two. The red/coral rug has a bit of the yellowy tan in it, and the scales of the two patterns are different. Overall, the number of colors between the two rugs is limited (unlike my library rug), so I don’t think we’d launch an entire house color scheme from them, but then look what I found. Yes, the fabric is a friggin’ fortune, but you’re going to save bank on your rugs, right? And you don’t need much. Perhaps just a pair of pillows. The Quetzal has our berry and gold, but also has various shades of aqua and teal, tan, orange, and gray/green. Bingo. So much color with which to create a whole-house color scheme. So, let’s say our berry red rug will be a family room rug (because that one is never going to show a stain!!!) and our gold rug will be a dining room rug and there’s a living room in-between. Mix your rugs from room to room as you would your fabrics in a single room — Orientals/neutrals/small patterns/geometrics/tonals. Flip flop your major pattern — Oriental on the floor, quieter patterns on the upholstery and vice versa. Make sure there is some color scheme threading its way from room to room. If you do put Orientals in adjoining rooms, mix up your scale/pattern but make sure they relate through your color scheme. Let’s use a neutral/less patterned rug for our floor in the living room and use the Queztal as a color/pattern bridge between our two Oriental rug rooms. With a Criss Cross jute rug from Fibreworks if you want to play it safe. Bind it in any color from Quetzal. Neutral menswear patterns, like this herringbone from Loloi or striped rug from Prestige Mills, beautifully balance the floral fabric and more formal Orientals. But you don’t have to go completely neutral! This striped carpet from Couristan looks fantastic. Have it bound into a rug. With a Beni Ourain, also from the auction, if you’re more design daring! Of course this doesn’t address wall color or coverings, additional fabrics, accessories, etc. — all the ways designers pull together color and help a house make sense from one room to another without having the place seem like it was pulled from a catalog, but I hope you get the idea. What will my client and I be doing? We’re starting with the living room rug, relaxing it a bit with the furnishings for a little less formal feel. There’s a kitchen and a family room in between that room and the dining room where the other rug will go, so there’s plenty of room for mixing it up, all the while creating that thematic thread. I’m excited! So go auction rug shopping! Look for unusual colors or patterns or just something that you love! Don’t be afraid of your parents’ fine Orientals, either. They’re free and worth a lot more than what you can find at a Big Box store. 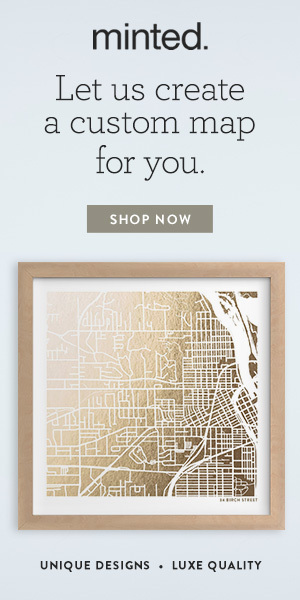 Wouldn’t you rather save your pennies — while giving your home some sophistication and uniqueness — too? As always, I love your ideas and appreciate all of the information. I’m in the process of looking for a living room rug myself, and this is helpful!